We serve as a convenient print, copy, and scan venue for students, faculty, and staff of the University of Montana in support of their learning, teaching, and research activities. Click on a service below to learn more about that service including pricing and material description. Current students, faculty, staff and sponsored affiliates of the University of Montana are eligible for UM Pricing. We adhere to the policies and procedures of the Mansfield Library and the University of Montana. Please view our full list of all hours in Mansfield Library. Whether The Paw Print is closed or open, the self-serve printers on levels one and three are always available to use by printing from a library computer. You can pay for self-serve printing through your UMoney account. We serve as a convenient print, copy, and scan venue for students, faculty, and staff of the University of Montana. We are located inside the Mansfield Library on level three. To be the most welcoming and helpful staff on campus, get along with each other, have a good time at work and deliver excellent customer service. We employ dozens of student employees who are both work study and non-work study. These employees work in the Paw Print and Circulation Departments. The student employees are supervised by eight staff members between the two departments. 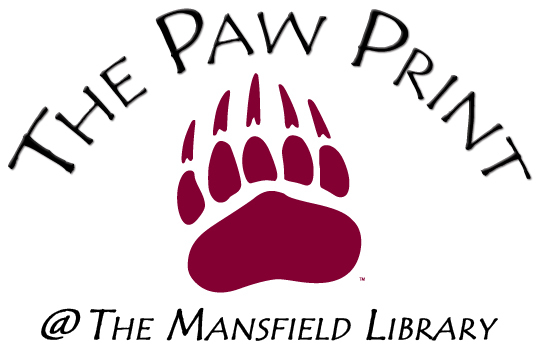 The Paw Print @ the Mansfield Library prints the vast majority of items on recycled paper. We currently use 30% recycled paper for all letter sized black and white copies/prints, 50% recycled paper for all sizes of color prints and copies. Our legal sizes are 50% recycled. All future standard paper products purchased will be non-virgin whenever possible. The Paw Print actively recycles everything that we can. Waste paper is reused or recycled. The library uses unwanted prints to create notepads for library staff and for scrap paper for the public. If we can not reuse the paper, it is sent to campus recycling. Xerox components and consumables are sent back to Xerox to be recycled, reused or safely disposed of. Art ink cartridges are recycled. Cardboard paper boxes are offered to staff members or library patrons for use and recycled if unwanted. All photocopy and photographic equipment are EnergyStar compliant. All machines that are not necessary for immediate operations are turned off. We use surge protectors prevent phantom power loss. The Paw Print has reduced interior lighting levels by 55%. Printers are defaulted to double sided. The Paw Print reduces the price per page on double sided printing/copying to encourage paper conservation. Print and copy jobs can be formatted to print multiple original pages onto a single sheet of paper. The Paw Print manages all print queues. Print jobs are paused unless requested by a patron, reducing waste by preventing unwanted jobs from being printed. The Mansfield Library employees take every precaution with handling material during scanning, copying and other services provided in The Paw Print. It is possible that personal property may be subject to wear and/or damage when subjected to the necessary processes involved in scanning, copying, and/or other services provided by the Paw Print. The Mansfield Library cannot be responsible for routine damage caused by the process. This institution reserves the right to refuse to accept a copy order if, in its judgment, fulfillment of the order would involve a violation of copyright law. Please note that all job orders must be placed in person at The Paw Print. Click here if you are interested in working for us!